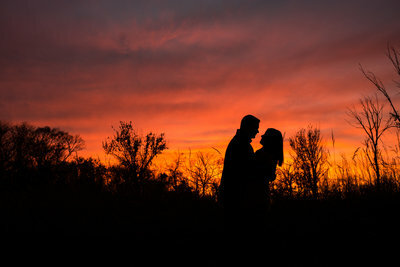 Katie and Will met with me for 2 different engagement photo sessions at Clinton Lake here in Lawrence, KS. Our first one we thought we could beat the rain but unfortunately when lightning strikes, we gone. (Pretend you heard me say that in a really dorky voice haha) We grabbed as many photos as we could before the lightning then opted to shoot another day that same week at Clinton Lake. You’ll see quite a difference in the lighting between both and some of the same moodier styles as well. These next photos are from our second shoot where we didn’t have a cloud in the sky. Gotta love Kansas weather sometimes. It’ll rain, snow, and get to 100 degrees in one day haha. If you love these photos and want to talk about booking your engagement session here in Lawrence, please reach out here.